Socotra is an island off of the coast of east Africa that is governed by Yemen. For centuries all the inhabitants of the islands of Socotra belonged the Ancient Assyrian Church of the East, which was known as the Nestorian Church. The Ancient Catholic and Apostolic Church of the East was a missionary church that founded Christian communities in Mongolia, China, and India while Western Europe was sleeping through its ‘Dark Ages.’ The Assyrian Church of the East thrived for centuries in these lands yet most of its churches were eradicated by Islamic warriors, leaving only the churches of India and a community in the original Assyrian homeland of the region of modern Iraq and Iran. One of the longest lasting churches established by Assyrian missionaries, that eventually also fell victim to the Muslim Jihad, was the Nestorian Church of the Island of Socotra which endured for over a thousand years. While Western Christendom was slumbering through the Dark Ages in Europe, the Assyrian Christians of the Ancient Church of the East in Mesopotamia were dutifully carrying out Jesus Christ’s Great Commission to carry his message of hope and love to the distant corners of the world1. With a fervent zeal Assyrian missionaries spread the Christian gospel to India, China, Mongolia, and Socotra, an isolated island in the midst of the Indian Ocean2. writers entirely escaped the influence of Greek culture in some form or another. The Assyrian Christians of the Church of the East came to be called Nestorian after Nestorius, a Patriarch of Constantinople from 428 until 432, whose Christological doctrine and method of Biblical interpretation was accepted by the Assyrians in that they mirrored those of their own ancient traditions. Nestorian Christians are not and never were heretics. The Assyrian Church of the East holds fast to the tenants of the Nicene Creed, and affirms the core doctrines of the Virgin Birth, the Holy Trinity, the Deity of Christ (meaning that Christ is God the Son as well as being the eternal Son of God), the literal and physical resurrection of Jesus Christ from the dead as well as the other basic doctrines held by all Christians whether they be Roman Catholic, Eastern Orthodox or Protestant6. A further example of Nestorian expansion is provided by the church on the island of Socotra, which dates from the 6th century and was to continue its life down until destruction by the Muslims after the period which concerns us here . The traveler Cosmas Indicopleustes found Christians there in the 6th century and we have records of consecrations of bishops for the island under the Patriarch Enush in 880 and Sabr-ishu III (d. AD 1072). Marco Polo (d. 1324) reported a bishop there who owed allegiance not to the pope in Rome but to a Patriarch at Baghdad, and the Bishop of Socotra was present at the consecration of Yaballah III as Patriarch in AD 12827. Socotra serves as an example of the zeal and rigid determination of the Assyrian Christians to take the gospel of Jesus Christ even to the most desolate and inaccessible regions on earth. Socotra is a land of myths and legends. The Phoenicians believed Socotra to be the abode of the Phoenix, a mythical bird believed by the ancients to fly from Socotra to Heliopolis in Egypt once every 500 years to rejuvenate itself in a sacred flame. Herodotus, Pliny the Elder and Diodorus of Sicily mention Socotra in regards to this legend. The description of Socotra by Diodorus of Sicily however, does contain authentic details about the island11. Later Arabs believed the island to be the dwelling place of the rukh, or roc, the mythological gigantic bird that has a prominent place in the voyages of Sinbad the Sailor12. The Pharaohs of Egypt also sent expeditions to Socotra to acquire Myrrh which was then as costly as gold13. In those days India had colonies, in Cambodia (Kumbuja in Sanskrit) in Sumatra, in Borneo, Socotra (Sukhadhara) and even in Japan. Indian traders had established settlements in Southern China, in the Malayan peninsula, in Arabia, in Egypt, in Persia, etc. Through the Persians and Arabs, India had cultivated trade relations with the Roman Empire14. These trade relations enabled St. Thomas to evangelize Socotra and India. Alexander the Great is believed to have conquered the island of Socotra in order to have the aloe for his army. A Greek presence continued up past the time Socotra was converted to Christianity. Socotra is rich in myrrh and aloes. Ancient peoples recognized medicinal value of aloe. Aloe and Myrrh were even used to anoint the body of Jesus the Christ upon his removal from the cross. Socotra continues to supply the world with aloe as it did in ancient times15. There is an island…it is called Dioscorida [meaning Socotra], and it is very large but desert and marshy…the inhabitants are few and they live on the coast towards the north, which from this side faces the continent. There are foreigners, a mixture of Arabs, and Indians, and Greeks, who have emigrated to carry on trade there16. The inhabitants [of Socotra] are baptized Christians and have and archbishop…I should explain that the archbishop of Socotra has nothing to do with the Pope at Rome, but is subject to an archbishop who lives at Baghdad [meaning the Patriarch of the Assyrian Church of the East]. The archbishop of Baghdad sends out the archbishop of this island; and he also sends out many others to different parts of the world, just as the Pope does…I give you my word that the Christians of this island are the most expert enchanters in the world. It is true that the archbishop does not approve of these enchantments and rebukes them for the practice. But this has no effect, because they say that their forefathers did these things of old and they are resolved to go on doing them. And the archbishop cannot override their resolve20. Arab accounts also describe witchcraft and sorcery as being prevalent among the Socotrans. The natives esteem themselves to be Christians and are very proud of it. They can neither read or write, possess no books nor other sources of information, and are very ignorant. But they have churches, crosses, and ritual lamps, and in each of village there is a caciz, who corresponds to a priest among us. Having no bells, they summon the people to services with wooden clapers, such as we have during Lent23. Other travelers contradict the statement of St. Francis and noted that the Socotrans did possess books written in Syriac characters. St. Francis and other Catholic travelers probably exaggerated the level of ignorance of the Socotrans. This is probably an exaggeration due to the contempt with which the Catholics until very recently have held members of the Assyrian Church who they viewed as ‘vile and pestilent Nestorian heretics’. It should be borne in mind that Francis Xavier himself recommended that the Holy Office of the Inquisition should be activated in India to deal with the Assyrian Christians there. In the mid-1500s an adaptation of a letter from King Joao III to Pope Paul III was published in both Italian and French editions. It summarizes the conversions affected under Portuguese auspices from Socotra to Moluccas, reports military reverses in Ethiopia, and mentions St. Francis Xavier. It speaks of the “conversion” of the St. Thomas Christians in a manner suggesting the same classification as Saracens [Muslims] and pagans24. Arabs also wrote important accounts of the Nestorian Christians of the Isle of Socotra. In 1488-1489 Ibn Magdid commented that Socotra was a Christian island ruled over by a woman. Al-Masudi, the famous Arabic geographer, wrote an account of the island. He died in 956 AD. Al-Hamdani, another Arabic geographer, wrote of Socotra and its Christians. He mentions monks being on the island. Al-Hammadi died in 945 AD.25 Yaqut writing in the thirteenth century described the inhabitants as “Christian Arabs”. The Masih, son of Maryam [Jesus Christ] appeared — peace be upon him – and the Greeks who stayed there [on the Isle of Socotra] adopted Christianity and remain Christians until the present time. Allah knows that there is no other place in the Universe except Socotra Island where there would live a population of Greeks which would retain its lineage without having anybody else mix with it26. Socotra is also called Asqo’tra, Sou’qatra and Soqotra. Other spellings include Suqutra and Socotora. The names derives from the Sanskrit word Sukhadara or Dripa Sukhadara which means ‘Island abode of Bliss’ The Ancient Greeks called it Dioskourdiou or Discordia. 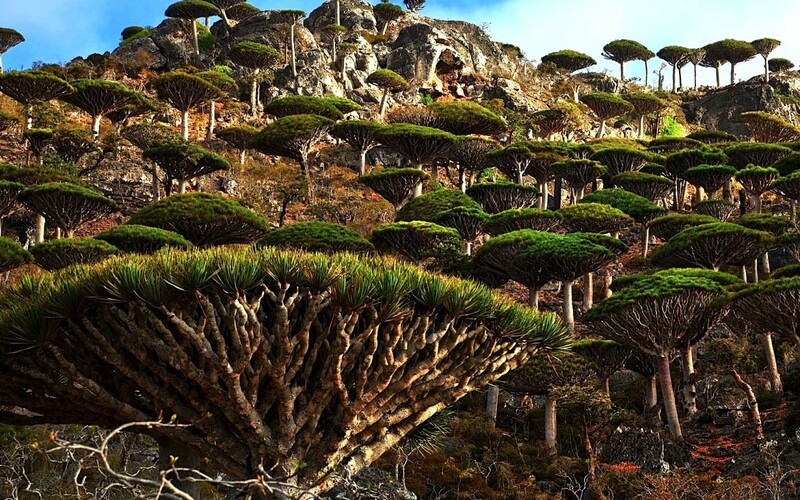 Socotra is also called the Isle of Mists and the Island of the Dragon’s Blood Tree. The Socotra Archipelago consists of Socotra and three outlying islands, Abd al-Kuri, Samha and Darsa. Socotra is the home of rare liquid products frankincense, black oblillnum and Dragons Blood. It exports aloes and herbal remedies. Socotra is the largest island in the Arab World. The deep waters of the Gulf of Aden and the Indian Ocean surround the island yet the waters immediately around the island are shallow and infested with sharks and pirates. Socotra is an extremely isolated island due to the monsoon winds that make it impossible to reach for half of the year. Due to its isolation unique plant life lives there, life-forms survive there that became extinct elsewhere in the world tens of thousands of years ago. The best article on the island of Socotra is Soqotras Misty Future written by Diccon Alexander and Anthony Miller and published in the July 1995 edition of New Scientist. This article is available on the Internet on the Royal Botanic Garden of Edinburgh Soqotra page. This site features an awesome virtual reality tour of the island through several panoramic photographs that gives a 360-degree view in which you can zoom in and out of with close-ups.29 Dr. Robert Mill of the Royal Botanic Garden in Edinburg Scotland wrote me and said, “The small Indian Ocean island of Socotra contains one of the richest and best preserved dry tropical floras in the world, over one third of the plant species and endemic and it is internationally recognized as a centre of exceptional biodiversity.31“The United Nations declared in Soqotra: Proceedings of the First International Symposium on Soqotra Island: Present and Future, “The Island of Socotra is undoubtedly a most precious natural asset. It has been nominated as a ‘World Heritage Site’ and as a ‘Man and Biosphere Reserve’. It has a rich and unique biodiversity that is unrivalled in the Indian Ocean and in the Arabian Region31“. Socotra is often compared to the Galapagos, the South American island whose unique wild life provoked Charles Darwin to invent the theory of evolution. The World Wildlife Federation declared, “The Socotran Archipelago has such a unique assemblage of animal and plant species that it has been described as an Arabian Eden. The islands are known for their plant diversity, including the dragon’s blood tree and a variety of succulents…While currently relatively pristine, the ecoregion has had along history of human occupation and over 50 endemic plants are listed on the IUCN Red List of Threatened Species. The Socotran Archipelago remains vulnerable to increased human activity and tourist and industrial development.”32 Strange animals have also been found on Socotra. The island is approximately 72 miles long and 22 miles across from north to south, and it lies over 500 miles south-east of Aden and about 300 miles from Mukalla, port of the Hadramawt. The island of Socotra lies in the Indian Ocean near the ancient sea routes from the Red Sea to India and East Africa. Travelers and scholars have long considered it to have great archeological potential. Socotra has also been a source of interests to linguists; in addition there is a wealth of material for specialists in the fields of botany and ornithology36. The Socotra archipelago consists of four islands-Socotra, ‘abd al Kuri, Semhah and Darsa-situated in the northern part of the Indian Ocean due east of Somalia… the climate of Socotra is influenced by both SW and NE monsoons. The SW monsoon blows from April until October bringing hot, dry winds which are generally desiccating but bring a little orographic rain to the mountains. Most precipitation occurs from November to March; during this period the SW winds are replaced by much lighter rains from the NE… Rainfall is very sporadic and in some years the costal areas receive none. Average measurements for the plain are around 150 mm and the mountains probably receive around 500 mm. Most rain falls in winter. The mountains are frequently shrouded in clouds and heavy dews are common37. Topographically the island can be divided into 3 main zones; the coastal plains, the limestone plateau and the Hagghier Mountains. It was a rugged country, with an overall limestone plateau averaging 1,500 feet in height, through which projected a central mountain range, the Haggier Massif, reaching nearly 5,000 feet. These mountains constituted one of the oldest land structures in the world and had been an ark of refuge for many strange and primitive forms of plants and lower animal life, found nowhere else. Frankincense, myrrh, dragon’s blood, cucumber and pomegranate trees grew there, …People lived on this island and they were of two sorts: on the coast were a mixed lot of Arabs and Africans; in the mountains lived the true Sokotri, who were aboriginals isolated on the island “from time immemorial”, living in caves, talking a unique language that nobody knew, subsisting on dates and milk39. The traditions of the Socotran natives differ from those of other Yemenis in that they are influenced by all of the nearby major regions: the Arabian Peninsula, the Horn of Africa and India. The Socotran people have their own language, which is a holdover from the ancient Himyaritic language. They share this language or variations of it with the people of Al-Mahara in Yemen and Dhofar in Oman40. The Socotrans are impoverished and isolated. The population of Socotra is estimated to between 20,000 and 80,000. Many of the mountain dwellers are troglodytes, living in caves. The coastal people are fisherman and pearl divers and are of African origin. They live in shacks made from palm leaves and tree limbs. Arab nomads dwell in the wadis. The Bedouin are shepherds and subsistence farmers41. There is racial diversity on the island. White Arabs live in the mountains and some Africans live on the coast. Tribal culture there is so strong that the people cannot even chop down a tree without consulting the tribal counsel. Socotra is isolated and inaccessible. Its people manage to eke out a wretched and poverty stricken existence. Socotrans are largely cut off from the rest of the world for five month of the year. Indian Ocean monsoon storms whip up violent seas making it impossible for the island to be resupplied by sea. (Socotra is usually reached by Dhow, an Arab sailing boat, from the coast of Yemen)42. The winds also make it dangerous to be reached by plane or helicopter. The continued rejection of the Islamic practice of polygamy is probably the only Christian custom preserved by the Socotrans44. Are there old books and are archeological remains pertaining to the Assyrian Church in Socotra? There are remains of churches and shrines and there are several inscriptions bearing the cross. Christian burial was practiced by the Socotrans. In Socotra: island of Tranquility the discovery of Christian tombs is described in the following manner. Most Christian remains have been destroyed by Muslem extremists. Several books deal with archeological excavations that have been undertaken on the island. We found traces of this past Christianity on the island. Not in the beliefs of the people but in the enigmatic stone remains dotted all over the island…There was nothing about these buildings which indicated that they were specifically Christian but they were much larger and more elaborate than the houses of the present-day Bedouin, and it seemed reasonable that they were the work of a more energetic and technically advanced people-in fact, the Christian ancestors of the came-dwellers of today…Here they sat chanting in choir alternately the uncomprehended language [Syriac], repeating three times a day the strange warped vestiges of the faith their ancestors had been taught by Thomas46. Researchers have tried to search out ancient Syriac manuscripts on Socotra. In Socotra: Island of Tranquility Brian Doe describes his failed attempt. The patriarchs are not entirely to blame due to the crisis and persecution they were facing at the time they were unable to support the mission. The Socotrans continued devotion to their Christian identity while they had neither ecclesiastical leaders nor religious education is to be admired. Despite the isolation and loss of contact with it’s mother church, the Socotrans remained committed to their Christian identity. It took an armed attack by Muslim fanatics from Arabia to deal the deathblow the Nestorian Church on Socotra. According to Vitaly V. Naumkin in The Island of the Pheonix: An Ethnographic Study of the People of Socotra. The non-Arab Semitic island of Socotra is now ruled over by the Arabs of Yemen. In historical overviews of the island the disingenuous Yemenis omit any reference to the existence of Christianity on the island. Typically the Arabs not only discount the Socotrans former tenacious Christian faith but also their current distinct ethnic identity. The language is misleadingly described as “Arabian”, (it may be ‘Arabian’ but it is not directly related to Arabic). Yemen Exploration Tours states that, “The inhabitants of the mountains…are nomads and descendants of an old South Arabian tribe speaking still the old Arabian dialect Soqotri related to the Mahri dialect.52” These languages are not dialects of Arabic as implied but distinct Semitic languages. The Island is described as the largest island in the Arab world it would be more accurate to describe it as the largest non-Arabic island in the Arab world. Assyrians, Berbers and Kurds receive similar treatment in other parts of the Arab world. These ethnic minorities suffer their culture denigrated, their historical and cultural contributions ignored and their very existence denied. The cultures of the indigenous peoples are under serious threat in these lands. Also Christian artifacts that are discovered may be vandalized by Muslim fanatics. We should remember the fate of pre-Islamic antiquities in Afghanistan under the Taliban. This is why we must document our history so we can at least preserve records of it before Islamic extremists attempt to erase the memories. The Assyrians should begin a museum that documents the achievements of the Church of the East to serve this purpose. In 1800 the fanatical and puritanical south Arabian tribe, the Wahabees, attacked Socotra, destroyed tombs, churches, and graveyards on the coast around Hadibo, and terrified the Bedouin into formally accepting the Mohammedan faith54. What has been done by this expedition is but a fragment of what is there to be accomplished…It happens that on this island within but three weeks’ journey from England, there dwells a people whose origin is lost in myth, and of whose speech the true relations are undetermined, who according to received reports, having obtained some degree of civilization and embraced Christianity have gone back from their advance position to the lower state in which we now find them and thus present to us a feature of great interest to the history of mankind. There is now on Socotra alone a wealth of material for explanation and investigation, which would amply reward the work of another expedition55. Though technological advances have reduced travel time drastically, his words hold true today, much work remains to be done on Socotra. Recently environmentalists, spelunkers, biologist, biochemists, algologists, ichthyologists, ethnologists, botanists, ornithologists, philologists and speleologists have descended on Socotra for various scientific pursuits. Assyrians should also support research to find and preserve relics from the past of the Church of the East. Special thanks to Johanna Sidey of the World conservation Monitoring Center, Dr. Robert A. Mill of the Royal Botanic Garden in Edinburgh, Scotland and Bette Craig of the Inter-library Loan Office of Sam Houston State University. Copyright 1994 Duel Enterprises, Inc. Gary , SD 57237, and used by permission. collection of Assyrian Christian texts discovered in China and Central Asia. It is useful but I take offense at Mr.
China and its contributions in an upcoming paper. 3 Assyrians speak Neo-Aramaic today which is sometimes called Syriac yet distinct from Classical Syriac of Edessa. According to S. G. Pothan in The Syrian Christians “Aramaic was the language of Jesus Christ and his apostles. (Trans World film, Italia, 2001) accompanied with 3 videotapes. Student (University of Birmingham 1980) p.4-5. It should also be noted that Nestorius declared the Tomeof Pope Leo as an expression of his own position. English Translation (Claredon Press, Oxford 1993) p. 488-454. 9 S. G. Pothan The Syrian Christians of Kerala (Asia Publishing Company, New York 1963) p.29. 10 G. W. B. Huntingform ed. Trans. The Periplus of the Eryphraean Sea (The Hakluyt Society, London, 1980) p.103. 11 Vialy V. Naumkin Island of the Pheonix: An Ethnographic Study of the People of Socotra (Ithaca Press 1993) p.
12 Tim Severin “In the Wake of Sinbad” National Geographic July 1982 p.2-40. 13 Charles K. Moser “The Isle of Frankincense” National Geographic March 1918 p. 267-278. 14 Shipbuilding and Navigation in Ancient India http://india.coolatlanta.com/GreatPages/sudheer/ship.html . 15 History of Aloe Vera http://www.aloeveraproducts.com/history_aloe_vera.html . 16 Brian Doe Socotra: Island of Tranquillity (Immel Publishing Limited, London, 1992) p.9. 17 Samuel Hugh Moffett A History of Christianity in Asia (Harper San Francisco 1992) p.267. 18 S. G. Pothan The Syrian Christians of Kerala (Asia Publishing Company, New York 1963) p.27. 20 Ronald Latham Trans. The Travels of Marco Polo (Penguin books, London, 1958) p. 296-298. 23 S. G. Pothan The Syrian Christians of Kerala (Asia Publishing Company, New York 1963) p.29. Minnesota, University of Minnesota Press, 1962) p.169. 25 Brian Doe Socotra: Island of Tranquillity (Immel Publishing Limited, 1992) p.136-144. 26 Brian Doe Socotra: Island of Tranquillity (Immel Publishing Limited) 1992) p. 137. 27 Thomas J. Abercrombie “Ibn Battuta: Prince of Travelers” National Geographic December 1991 P. 5-49.
has created a wonderful website dedicated to Socotra and its people at www.soqotra.com . 29 Diccon Alexander and Anthony Miller “Socotra’s Misty Future” New Scientist Vol. 147 No. 1988 29 July 1995 p.
30 Personal correspondence of the author dated 2/23/1996. Future (United Nations, New York 1998). International Research on Socotran Cormorants http://arabianwilklife.com/vo2.3/corres.html. 34 Diccon Alexander and Anthony Miller “Socotra’s Misty Future” New Scientist Vol. 147 No. 1988 29 July 1995 p.
36 Brian Doe Socotra: Island of Tranquillity (Immel Publishing Limited, London, 1992) p.5. association with Royal Botanic Gardin Edinburg, Royal Botnaic Gardens, Kew, 1996) p.7,11. 39 Douglas Botting Island of the Dragon’s Blood (Hodder and Stoughton, London 1958) p.22-23. 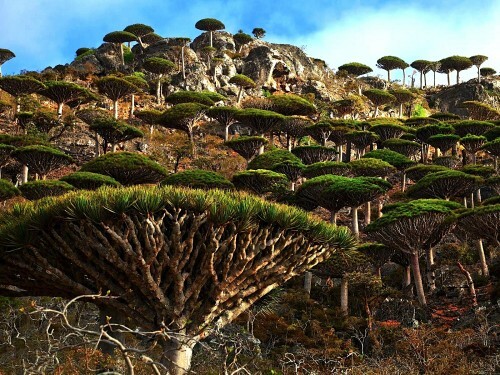 40 The Enchanted Island: Socotra Reveals Its Secrets http://www.yementimes.com/97/iss42/lastpage.html . 41 Yemen Exploration tours: Socotra http://www.al-bab.com/yet/socotra.html . 42 Marion Kaplan “Twilight of the Arab Dhow” National Geographic September 1974 p. 330-351. 43 Douglas Botting Island of the Dragon’s Blood (Hodder and Stoughton, London 1958) p. 215. 45 Brian Doe Socotra: Island of Tranquillity (Immel Publishing Limited, London, 1992) p.33. 46 Douglas Botting Island of the Dragon’s Blood (Hodder and Stoughton, London 1958) p. 216. 48 Brian Doe Socotra: Island of Tranquillity (Immel Publishing Limited, London, 1992) p.214. 49 “The Socotran of Yemen” http://www.bethany.com/profiles/p_code3/891.html . Rubrucks travels among the Nestorians in Mongolia as well as the accounts of the Nestorians of Socotra..
51 Douglas Botting Island of the Dragon’s Blood (Hodder and Stoughton, London 1958) p. 214.
of Wonders” Yemen Times 5 November 2001, Vol. XI http://www.yeenimes.com/1.is45.culture.html . a rewarding experience to a cautious and intrepid traveler. terror carried out in the name of Islam in many parts of the world today from the Philippines to the United States. 55 Douglas Botting Island of the Dragon’s Blood (Hodder and Stoughton, London 1958) p.23.